FISHERS, Ind. 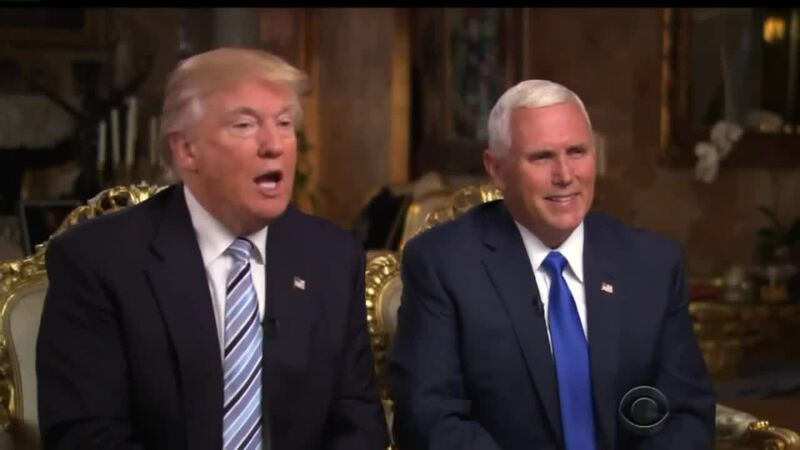 -- During the first joint interview between the Republican presidential candidate and his newly named running mate, Governor Mike Pence, Donald Trump said the duo, "will have very, very good chemistry," but a local body language trainer says the two have ways to go. "The feeling I get from watching their behavior is that they are still defining roles," certified body language trainer and non-verbal skills coach Lisa Mitchell said. Mitchell studies micro expressions that are common among all humans. She explains the expressions as a person's initial response to a question or action and says they are very hard to fake. "As adults we get very good at avoiding judgment," Mitchell said. "So we put on a mask of what people expect to see from us but that initial reaction is really, really hard to hide." One of the actions that Mitchell saw Trump repeatedly do to assert his dominance over his VP pick is when he invaded Pence's space. During talks about the Trans-Pacific Partnership Mitchell said you could see Trump lean in to stop Pence from speaking. "Which speaks pretty strongly to the fact he is putting him in his place literally," she said. #Trumppence Paraphrasing 13th Prez Millard Filmore, "Let the TP jokes go forth." Another example of Trump invading Pence's space was when 60 Minutes' Lesley Stahl questioned Pence on his decision to vote for the Iraq war. This time, Trump gave Pence a bump on the shoulder and said, "he's entitled to mistake every once in a while." Mitchell said Trump's body language suggested, "it wasn't a good decision, but we'll let it slide," Mitchell said. "Don't do it again was kind of the nonverbal verbiage." Other expressions that jumped out to Mitchell were some awkward pauses when seeing who would answer the question first, some smerks and a few one-shoulder dips before answering questions. However, she said she did see Pence become more confident when asked if he would go into Trump's office to confront him about a policy or decision he disagreed with. "I do believe based on how his posture was, the fact that he did the affirming head nod, the fact that he punctuated not aggressively, but definitely that he was comfortable and he did believe in his heart that was something that he would be willing and able and comfortable to do," Mitchell said. Mitchell said the two candidates will become more familiar with each other and the questions they are facing as the the continue on the campaign trail. Signs to show the two are developing more chemistry include more eye contact and seeing them tag team questions, according to Mitchell.